The Cuisinart 722-911NS chef's classic two piece open skillet set is ideal to sauces, vegetables or meats, heats and cools quickly for precise temperature control. It features 18/10 stainless- steel mirror exterior and quantanium non stick interior which is ideal for healthy cooking and low fat diets. The skillet has pure aluminum encapsulated base for fast and even heating. The cookware's riveted stainless-steel handle stays cool on the stovetop. The 2 Pk Ns Skillets 9 11 Chef Classic Stainless has many exciting features for users of all types. 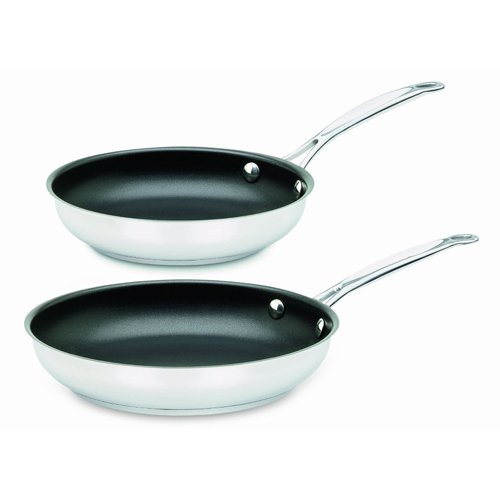 The 2 Pk Ns Skillets 9 11 Chef Classic Stainless is sold as a Brand New Unopened Item.